Become inspired by this vast collection of meditative drawing tiles known as tangles! 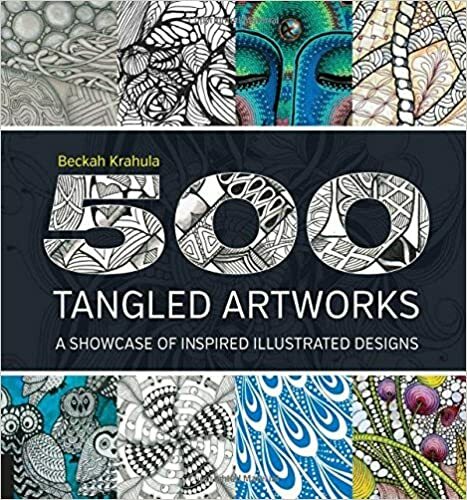 500 Tangled Art Works, curated by Beckah Krahula, author of the bestselling book, One Zentangle a Day, is the first book to feature a large and wide-ranging collection of exciting, beautiful, and experimental drawings. Tangles, a one to four stroke repetitive pattern used in a meditative art form called Zentangle(TM), are showing up all over the world in drawings, paintings, and many forms of mixed media art. With an introduction and history of this zen art form, 500 Tangled Art Works shares basic techniques, and features a cutting edge collection of the latest and greatest drawing from this contemporary movement. After seeing this amazing assortment of art, it will be easier than ever to start tangling on your own!